We were heading to Thailand and Cambodia to celebrate my 40th birthday. When we found out about Pack for a Purpose, it afforded us the opportunity to give back for my birthday. We filled a duffel bag with school supplies and dropped it off in Chiang Mai for the local school supported by Buffalo Tours. 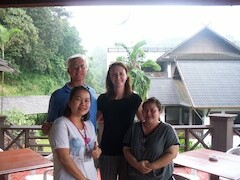 The photo includes our guide and driver from Chiang Mai. They helped us to drop off the bag at the Buffalo Tours office. A great way to celebrate my birthday!